Background: Booker attended Stanford University, receiving a BA in political science and an MA in sociology. Afterwards, he studied at the University of Oxford, earning an honors degree in U.S. history. He served two terms as the mayor of Newark. Afterwards, he ran for U.S. senate in 2013, a position he won and has held since. Health Care: Booker opposes overturning Roe v. Wade. He's stated that he believes that the Affordable Care Act is imperfect, should be improved, and wants to control health care costs. He supports transitioning to a socialist "Medicare-for-all" system and was one of the 14 co-sponsors who submitted the Medicare for All bill to Congress. 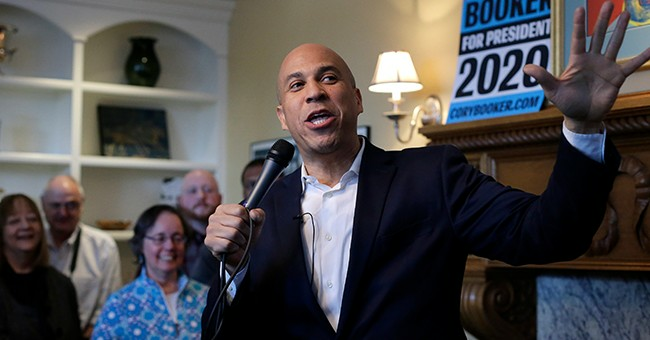 Abortion: Booker voted against the Born-Alive Bill of 2019. Immigration: Booker supports the passage of the DREAM Act, which would give citizenship to illegal immigrants brought to the United States as children. In January 2019, Booker was one of the 20 senators to sponsor the Dream Confidentiality Act, which would impose a ban on the Department of Homeland Security from passing information collected on DACA recipients to ICE, CBP, the Department of Justice or any other law enforcement agency. Economy: Booker supports raising the minimum wage to $15 an hour. He's also in favor of creating "baby-bonds," where newborns would be given low-risk savings accounts that would be worth tens of thousands of dollars by the age of 18. These accounts would be managed by the Treasury. He's championed "enterprise zones," which would be a free-market system to solve urban blight. However, he's said that in order for the tech sector to reach its fullest potential the U.S. government needs to ease up on regulations. Gun Control: Booker has publicly defended the right of law-abiding citizens to own legal fire arms and blames most shootings on criminals with illegal guns. Booker has confessed to groping a fellow student in 1992. He has also accepted numerous plentiful donations from Wall Street in the past, landing him in hot water with the progressive left.